The 1840 Presidential campaign has always gone down as one that introduced a new style of campaigning. One where a candidate would actively seek the office and give speeches. And, a campaign which would be more about personalities than issues. 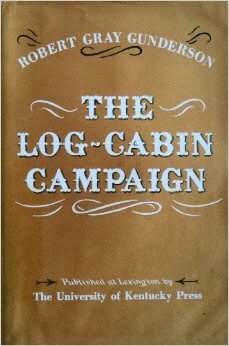 One would think that a pretty good book could be written about this campaign. This 1957 book by a University of Kentucky speech professor is not a good book. While it professes to be scholarly (it has footnotes! ), the author uses a style of prose that makes him sound like a frat pledge from the 1980s. All the major figures are referred to by nicknames. Whig candidate William Henry Harrison has so many nicknames that you can lose track (the Hero of Tippecanoe, Old Tip, Tip, Cincinnatus, The County Clerk) of just who the author is referring to. The book goes on and on about various Whig party powerbrokers (in particular Thurlow Weed) and how they raised money or found stump speakers (such as Abraham Lincoln) to help Harrison’s campaign. But the book is mostly just a series of anecdotes strung together with some old timey speak tossed in. Just what Harrison stood for was never clear. But, the Whigs were never big on details. They just wanted to be elected. That, and have a national bank. Other than that, they were mostly just hoping that Andrew Jackson, or his designated successor, Van Buren, would be embarrassed. If there is anything interesting to be gleaned from this book, it’s mostly just some trivia about William Henry Harrison. For example, did you know that at the time of the election, Harrison’s job was Clerk of the County Courts (hence the nickname above) in Sandusky County, Ohio? He had been out of work for a while. And in 1840, Whig rallies tend to consist of people rolling giant canvas balls with the name of supporters written on them. The idea was to “get the ball rolling for Tip.” It was also to make fun of Missouri Democratic Senator Thomas Hart Benton, who had given a speech in 1837, leading to the reversal of the Senate’s censure of Andrew Jackson. Harrison outpolled Van Buren by 126,000 votes. That wouldn’t amount to much today, but in 1840, that was good enough for a 6 point win. The Electoral vote was even more exaggerated with Harrison earning 234 votes to Van Buren’s 60. (Johnson lost 12 electoral votes for Vice President to other Southerners, including future President James Polk.) Van Buren had little chance of winning after the nation suffered a severe economic downturn in 1837. Credit was extraordinarily tight, and the public had soured on the Democrats having a monopoly on power pretty much since 1801. Ultimately, Harrison has gone down in history mostly because he died after just a little bit more than a month after his inauguration. It was popularly believed that he contracted pneumonia after delivering a lengthy inaugural address in cold weather, but it seems more likely that he died of complications from being 68, being stressed out, and drinking Washington D.C.’s poor water. Vice President John Tyler succeeded him and turned out to hold none of Harrison’s (or the Whig Party’s) positions on just about anything. And nobody was happy for four years.